4. Can't talk, I'm skating. Call you back later. 8. Ahh, there it is. 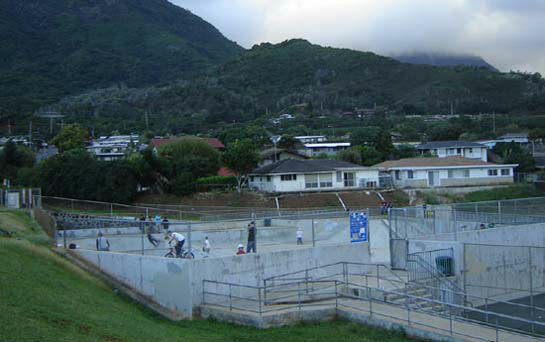 (2/21/02) KEOLU SKATEPARK OPENS TO THE PUBLIC SATURDAY - Keolu Hills Neighborhood Skatepark, in Kailua on the Windward side of Oahu, is a 15,000 square feet skateboarding facility, will be officially dedicated to the public at the Grand Opening ceremony Saturday, February 23, at 10 a.m. with Mayor Jeremy Harris and other elected officials participating. 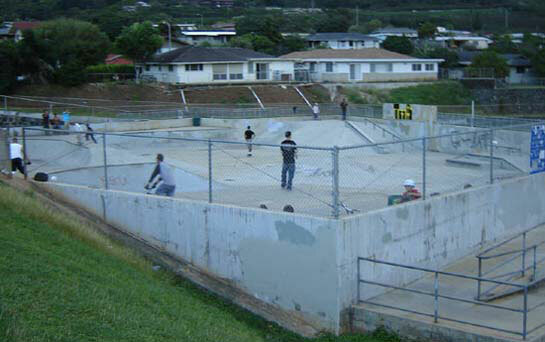 The skatepark is located at 1416 Keolu Drive, next to Keolu Elementary School. A ten-minute skateboarding demonstration by 808 Skate Team and entertainment by the Eastside Wrecking Crew will be part of the festivities. Star 101.9 van and the �supernovas� will be on site distributing free samples and giveaways. 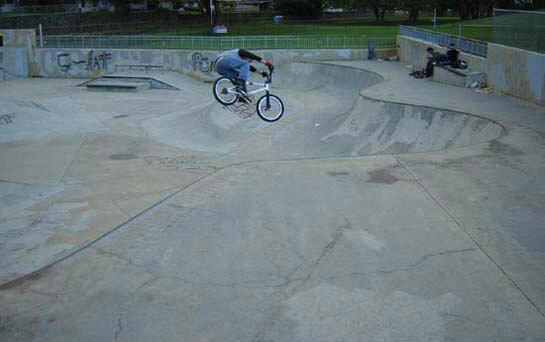 The stand-alone facility is ADA accessible and complete with built-in bowls, quarterpipes, rails, benches and ramps. Contractor of the facility is Alan Shintani, Inc. 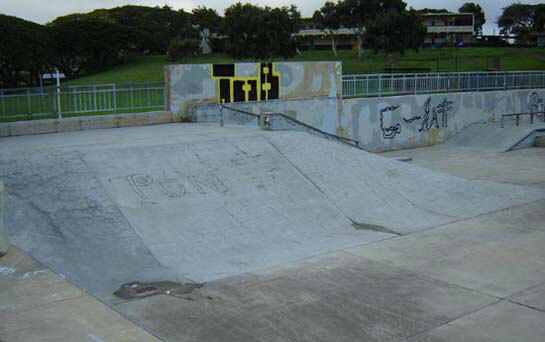 The skateboard park was designed by Kodama Okamoto Architects, Inc. with the assistance of skateboarder/consultant Chuck Mitsui, who is also the owner of 808 Skate and President of the Association of Skateboarders Hawaii. 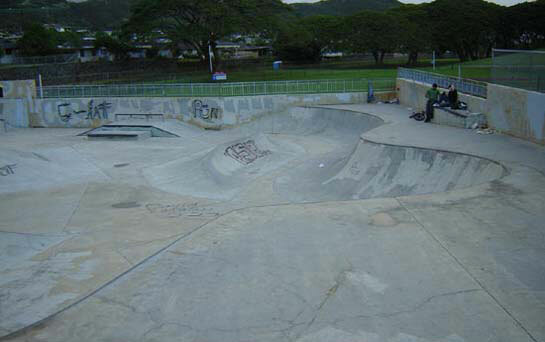 The Kailua community has been anxiously awaiting the completion of the skatepark, which will be officially accepted by the City today following final inspection. 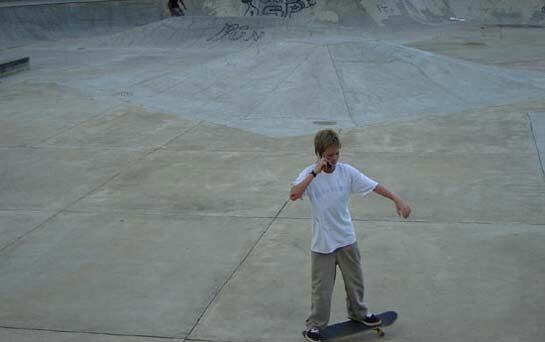 (2/23/02) SHOWPIECE SKATEPARK OPENS IN KAILUA - More than 200 people showed up this morning to attend the dedication and grand opening of the Keolu Hills Neighborhood Skatepark at 1416 Keolu Drive. Festivities included brief remarks by Mayor Jeremy Harris and Deputy Parks Director �Skippa� Diaz, followed by a prayer officiated by Pastor Dolan Dela Pena, Youth Pastor for Hope Chapel, Olomana. Senator Bob Hogue, 808 Skate owners Chuck Mitsui, Tony and Susan Kransic assisted Mayor Jeremy Harris with untying the traditional maile lei. The ceremony culminated with a 10-minute demonstration by members of 808 Skate, narrarated by owner Chuck Mitsui, to the music of the popular Eastside Wrecking Crew. 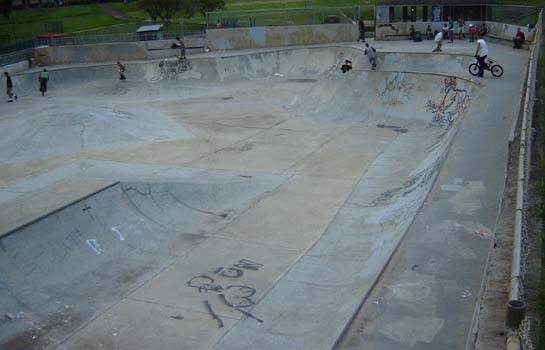 At the conclusion of the demonstration, hordes of skateboarders, from elementary to post college, joined in obvious delight of the 15,000 square feet skating facility complete with sophisticated built-in obstacles such as banks, bowls, quarterpipes and rails. Contractor for the project is Alan Shintani, Inc. and consultant was Kodama Okamoto Architects, Inc. 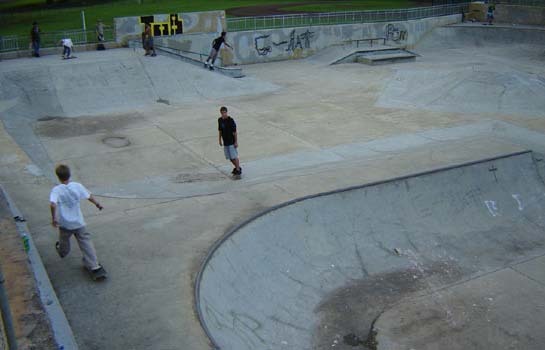 The City will be opening the new and improved Aala Skate Park in the next two weeks, followed by Kamilo�iki Skate Park and another skateboarding facility in Kailua District Park. There will be a total of nine skate parks on Oahu this year, according to Mayor Harris. 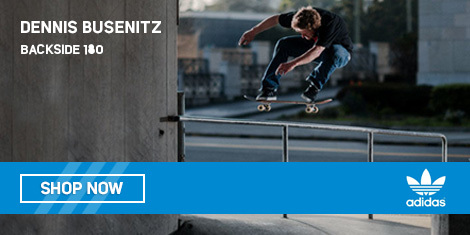 Skateboarding is one of the fastest-growing extreme sports in the nation. Figures today indicate participation exceeds 10 million in the United States. A fairly promising design which probably looked better on paper than an overly crowded park full of kids. Believe it or not, at a mere 15,000 square feet, this is the largest public skatepark on Oahu to date. The transitions were formed using solid cement - this is a first. Some sections are about 6' high. The cement work is lumpy but a bit more true to radius than Millilani. Not much carving will be going on in these open U-shaped bowls, the flow is more of a hip-transfer crash course layout. 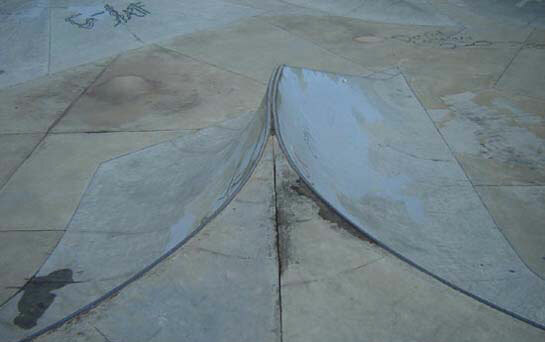 Drains in these parks would allow obstacles to be enclosed and collisions into other skaters would be minimized. Why do all the parks in Hawaii to date have such a rough finish? Obviously, the contractors have not figured out how, or that, everything should be highly wet-polished like a smooth parking garage. Keolu is a first for Oahu, with rounded capsuled bowls and organic slug-shaped obstacles. After a nice rainy day the 'uphill' capsule fills with foot or two of water - displaying the shoddy craftsmanship of the park.